Overlooked Albums of the ’90s – Whipping Boy “Heartworm” | "I Prefer Their Old Stuff"
I was initially planning on doing a cloudcast of lesser known ’90s tunes (which I still might do) and this then gave me the idea of doing a series of posts about particular overlooked albums from that decade. 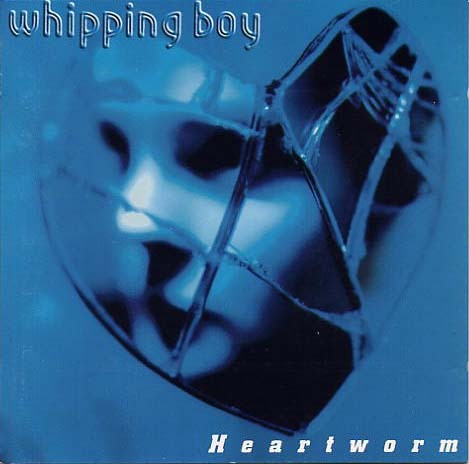 The first album I am going to talk about is “Heartworm” the second album by Dublin band Whipping Boy. Whipping Boy were formed in 1988 and released their debut “Submarine” in 1992 (long deleted unfortunately), this album, although critically acclaimed was not met with much commercial success. In 1995 they returned with “Heartworm“, bringing with it a change in their style away from the My Bloody Valentine and Jesus & Mary Chain noise and aural chaos to be more “accessible/radio friendly”, this worked and the album received, as well as more critical acclaim, far better commercial success with the three singles released from it even reaching the lower echelons of the UK chart (#51, #46 & #55 respectively). Kicking off with the tweely titled “Twinkle”, strings lead into crunchy guitars and Fearghal McKee’s Dublin-inflected vocals singing the song’s chorus of “She’s the only one for me / Now and always”. It was refreshing to hear a band not hiding their regional accents as at the time it was still pretty de rigueur to either sing in a neutral voice or affect an american accent. Talk about starting off the album with a bang, on first listen I was immediately smitten and to this day this track remains one of my favourites on the album! Although they admittedly could have been lumped in with drearier contemporaries such as Travis or The Stereophonics, covering subjects such as growing up in the 80s (“When We Were Young”), domestic violence (“We Don’t Need Nobody Else”) and mental illness (“A Natural”) they had a much wider and darker appeal that lifted them above such comparisons. At the time Britpop was at its height and tragically this fantastic album got overlooked in favour of albums such as Blur’s successor to mockney knees-up “Parklife”, “The Great Escape” and Oasis’s “(What’s The Story) Morning Glory?”. A shame, as I personally feel that this album blows both of these mega-successful albums into the weeds, I can’t remember the last time I had any desire to listen to either of those but I still give “Heartworm” regular spins and it still never fails to impress. It is one of those rare records that I remember where I was and what I was doing when I first heard it, there are few albums for which I can claim that. It could be said that this album was ahead of its time and may well now be rightly regarded as the classic it is had it been released a few years later, it could also be due to the fact that an album called “The Bends” was released by some band called Radiohead six months before it and possibly stole the thunder it may have triggered had they been released the other way around! The band went their separate ways in 1998 after being dropped by Columbia Records leaving a third album unreleased. This self-titled album was eventually released in 2000 on the band’s own label, but, aside from a couple of decent tracks, it really doesn’t stand up against its predecessor. The band reformed in 2005 and played a few shows but a promised new album has not appeared. To be honest, having heard the other albums, I feel that they might have been a band with just one great album in them and it may be better to leave it at that. This entry was posted on May 8, 2011, 1:12 pm and is filed under Features. You can follow any responses to this entry through RSS 2.0. You can leave a response, or trackback from your own site.